An outstanding career spanning three decades has made the Auryn Quartet one of the most sought-after and respected ensembles performing around the globe. The Quartet has not changed its personnel over this long period, and continues with its fresh and pioneering approach to all genres of music. The Auryn’s main mentors were the Amadeus Quartet, and the Guarneri Quartet with which they studied between 1982 and ’87 in Cologne, Germany, and at the University of Maryland, USA. Claudio Abbado was also an important influence on the Quartet’s musical development, under whose baton they performed as string principles in the European Union Youth Orchestra. 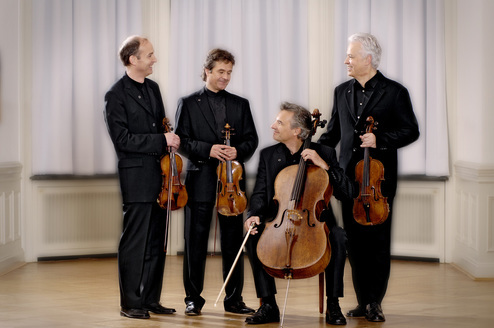 The Quartet won its first prizes at the London International Competition and the ARD Munich competition, both in 1982, only one year after the group’s inception. The ensemble also won the main prize at the European Broadcasting Competition in Bratislava in 1989. Invitations to most international music festivals followed in quick succession: Lockenhaus, Salzburger Festspiele, Edinburgh International Festival, Musiktage Mondsee, Schwetzinger Festspiele, and Stavangar festivals just to name a few. Recent tours have taken the Quartet from the Lincoln Center in New York, to the Concertgebouw in Amsterdam, and also to the Wigmore Hall in London, where they performed a complete cycle of the Beethoven quartets. The Auryn Quartet has had many fruitful musical partnerships over the years, with performers such as Menahem Pressler, Tabea Zimmerman, Alexander Lonquich, Sharon Kam, Nobuko Imai, Christian Poltéra, Peter Orth, Michael Tree, Martin Fröst, Liza Ferschtman, Cecile Licad, Dietrich Fischer-Dieskau, Christine Schäfer and many others. The Quartet now runs its own annual chamber music festival in the Venetian town of Este in Italy (Incontri Internazionali) and is Artistic Director of the Musiktage Mondsee in Austria. The Auryns have a compelling discography, working exclusively with the Tacet company since 2000. The most recent and ambitious recording project is the edition of all 68 Haydn quartets, which was finished in September 2010. Three complete concert-series of the Haydn quartets, each comprising 18 concerts, were performed by the Auryns in Detmold, in Cologne (West German Radio), and Padova, Italy, in commemoration of the Haydn bicentennial year 2009. The four musicians of the Auryn Quartet play on wonderful Italian instruments: a Stradivari violin (1722, ex-Joachim), a Petrus Guarneri violin, a Brothers Amati viola (1616) and a Niccolo Amati cello. Since 2003 the Auryn Quartet has been sharing its wealth of experience with musicians of younger generations, in the form of a teaching position at the Music Academy in Detmold, Germany, where they are professors for chamber-music.